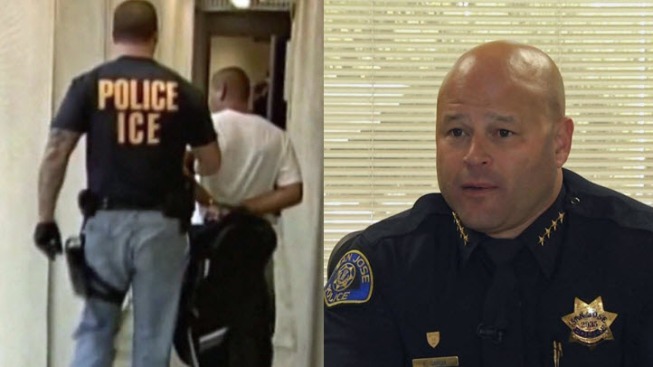 San Jose police Chief Eddie Garcia met with federal immigration agents Wednesday to gain a clearer understanding of the their mission and strategy in the South Bay and to keep his department in the loop on their activity. It’s been two weeks since rumors of federal Immigration and Customs Enforcement raids in San Jose triggered a community panic and sent people into hiding. Garcia said the main takeaway from Wednesday's meeting was that an open line of communication between his department and the local ICE office has been established. But the chief also warned that ICE has full discretion on what it does on city streets. On Wednesday, things seemed finally to be getting back to normal on Story and King roads in San Jose. But two weeks ago, people were scrambling and went into hiding after rumors of ICE raids. "The businesses were dead; no one wanted to come shop," merchant Michelle Calderon said. "They were very scared." The police department also scrambled to get answers that day. "We cannot be operating in the dark," Garcia said. And even though the rumors were just that, rumors, the confusion and disarray that resulted prompted Wednesday's crucial meeting. "I met with them to be an advocate for our community, to explain to them the fears that are occurring in our community," Garcia said. ICE will call whenever it is about to conduct enforcement action in San Jose. When looking for a convicted criminal in a home, ICE agents reserve the right to detain other people inside that home, as they did in Santa Cruz on Feb. 13. ICE will not detain a victim or witness of a crime. The chief added that the agency warned the rules could change at any time. "There are no promises," he said. "I don’t want to give false hope that we were able to tell a federal agency what they can and can't do because that’s not reality." But the chief also told ICE it cannot count on his officers during sweeps. "We’re not taking part in immigration enforcement as a police department," Garcia said. Garcia said ICE is receptive to the idea of holding a community forum, where they can publicly explain their role and mission directly to the residents.